The player is the frame around your course. 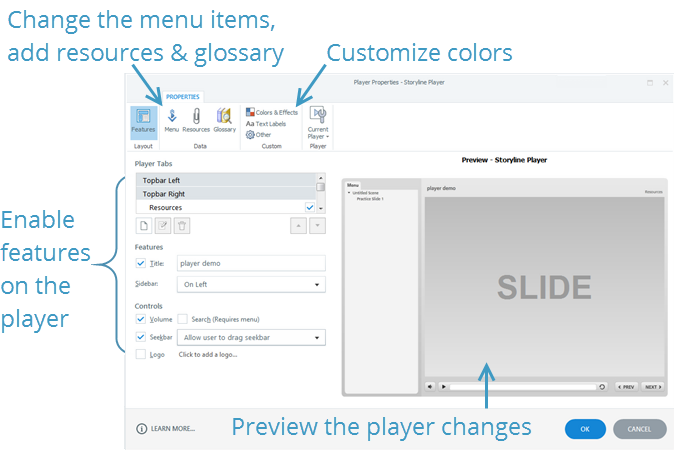 By default in Articulate Storyline 2, it'll include a left sidebar menu and slide content area, but you’re not limited to the default look. In fact, you can customize the player in a bunch of ways with just a few clicks. In this tutorial, you'll see just how easy it is to customize the course player. Watch this video first, then follow the steps below to practice. If you haven't already, download these practice files. It's really that simple to modify the player in Storyline. Practice making a few modifications so you're familiar with the options. Then, when you need a custom player, you'll know where to start. When you're ready, jump ahead to customizing the player at the slide level.